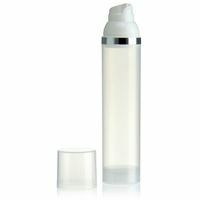 Buy airless dispenser at most favorabe prices on www.world-of-bottles.co.uk. 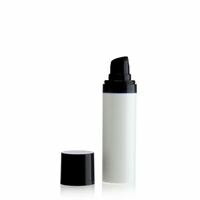 Suitable for cosmetics, toiletries, baby products, serums, body creams, lotions, soaps, eye gels, cosmetic creams, foundation and many more. 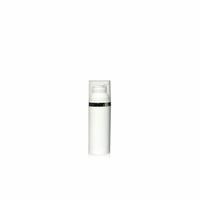 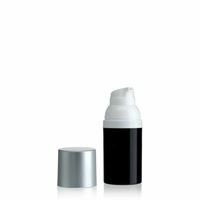 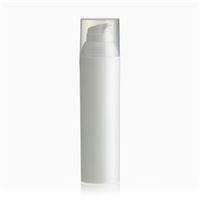 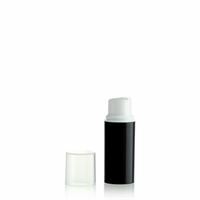 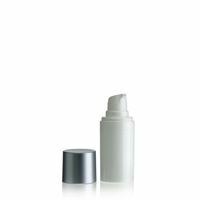 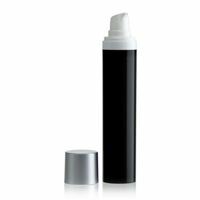 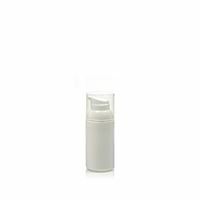 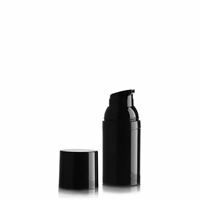 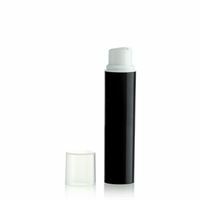 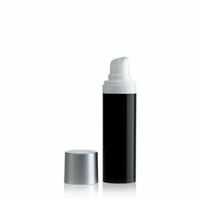 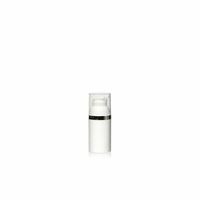 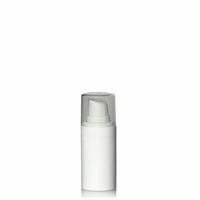 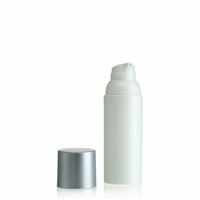 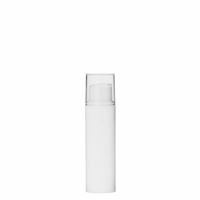 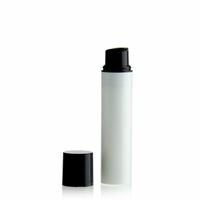 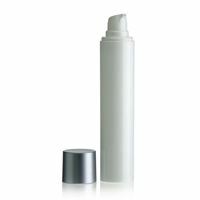 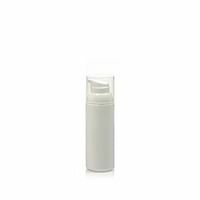 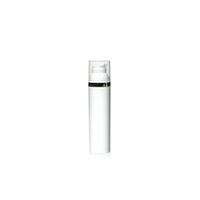 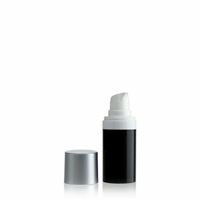 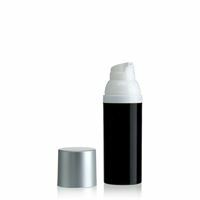 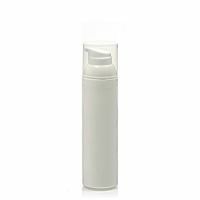 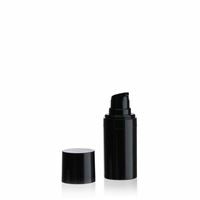 50ml PP Airless Dispenser "Wonderful White"
50ml PP Airless Pump MICRO "Silver cap"
75ml PP Airless Dispenser "Wonderful White"
Looking for a pure and smooth way to dispense cosmetics? 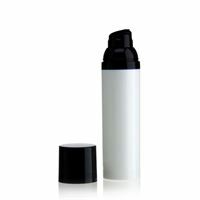 An airless dispenser is a high-quality pump packaging for dispensing cosmetic products. 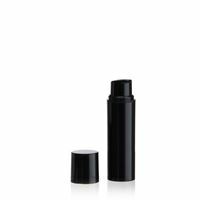 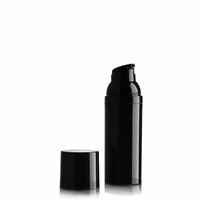 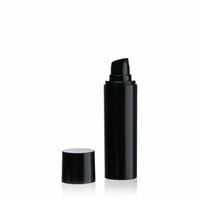 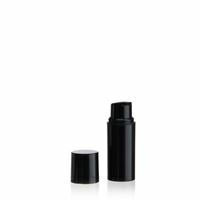 Airless means that neither air nor propellant is used to dispense the cosmetic product. Airless dispensers can be filled at room temperature and are suitable for balms, creams, concoctions, fluids, gels, ointments and organic cosmetics. Depending on the variant, the content of an airless dispenser is well protected against light, oxygen and germs. 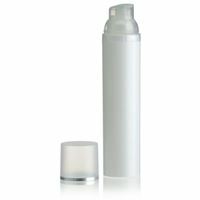 An airless dispenser is a closed dosage system free of air. 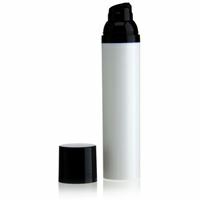 The dosage is carried out by negative pressure that is created by the lifting pressure of the dispensers pump. 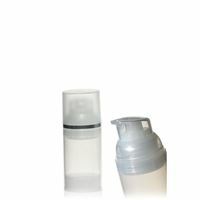 This working principle is simple; nevertheless, it leads to an accurate and reliable discharge of the content with an efficiency of up to 97 %. 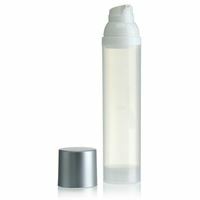 All individual parts of an airless dispenser are made of plastic, completely without the use of metal. 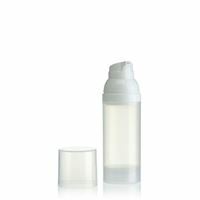 Airless dispensers are intended for single use. An airless dispensers consists of two main parts, a dispensing pump with protective cap and a reservoir, which is available in a variety of volumes. Dispensers from the "Nobless" and "Silver Line" series are decorated with silver rings round the dispensers heads while the dispensers series "Silver Cap" impresses with its silver coloured protective caps. 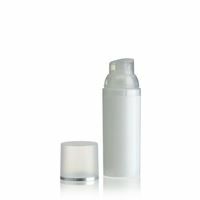 The offered airless dispensers are available in different sizes due to their reservoirs having both different heights and diameters. 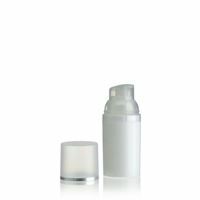 Available colours include white, silver, black, transparent and frosted look. 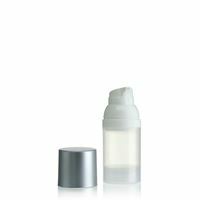 Volumes: 5 ml, 10 ml, 15 ml. 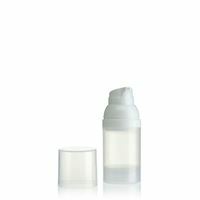 Volumes: 15 ml, 30 ml, 50 ml. 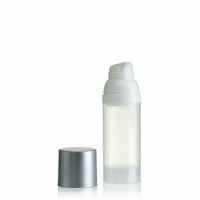 Volumes: 30 ml, 50 ml, 75 ml, 100 ml. 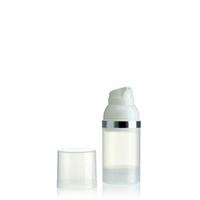 15 ml variant = minimum approx. 16.3 ml. 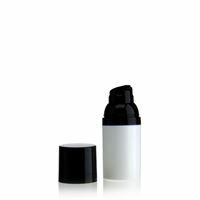 30 ml variant = minimum approx. 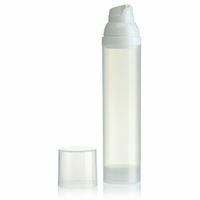 31.3 ml. 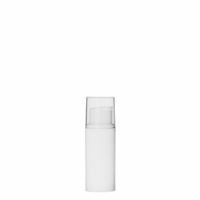 50 ml variant = minimum approx. 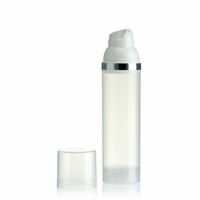 51.3 ml (based on a density of 1.0 g / ml). 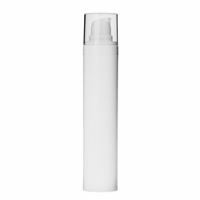 75 ml variant = minimum approx. 80.0 ml. 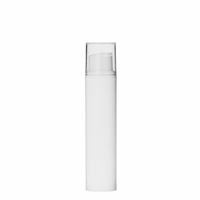 15 ml variant = maximum approx. 17.3 ml. 30 ml variant = maximum approx. 33.9 ml. 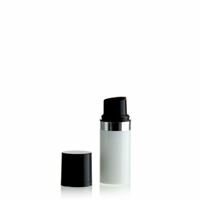 50 ml variant = maximum approx. 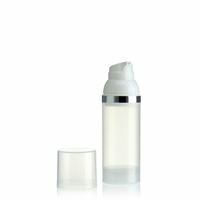 55.0 ml (based on a density of 1.0 g / ml). 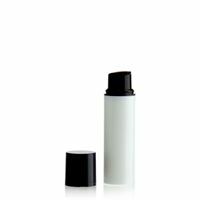 75 ml variant = maximum approx. 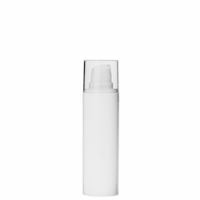 81.5 ml. When filling, an air gap is created between the content and the underside of the pump head; eliminating it requires just a few pump strokes. 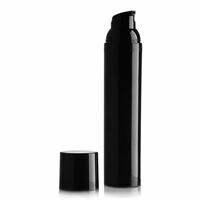 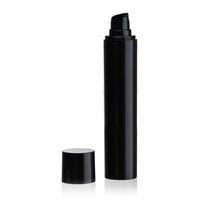 These small trendy pump packages offer several advantages over cosmetic pots and spray bottles. 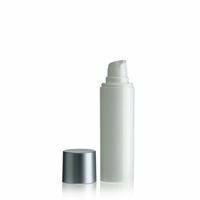 They allow an exact dosage, prevent the content from coming into contact with air and protect against germs; as a result, the use of preservatives can be reduced whilst shelf life can be increased. 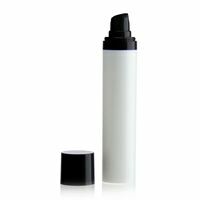 Depending on the colour, this form of dispensing packaging also protects against sunlight. 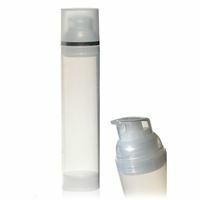 The dispensers pump head is provided with a cap that prevents the pump from being accidentally pressed. 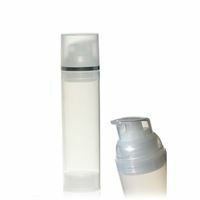 The high discharge of residuals is an additional argument in favour of using airless pump bottles. 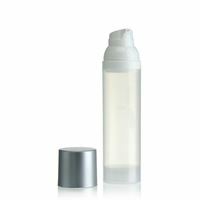 Airless dispensers are safe and easy to storage and transport because they are made of lightweight and unbreakable plastic. Airless dispensers' mode of operation makes it possible to dispense without the use of propellant gases, aerosols or compressed air and thus offers safer handling for the user. 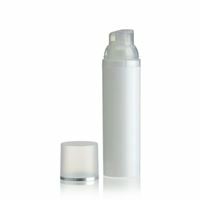 Buy airless dispensers cheaply here at World-of-Bottles.co.uk. 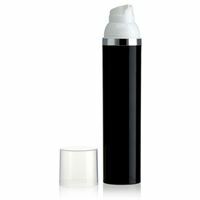 In our online store, you will find a wide assortment of airless dispensers in different variations. 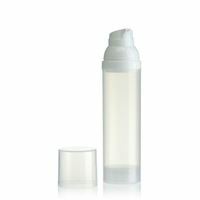 In each price range, World-of-Bottles offers dispensing solutions that will exactly match your needs. 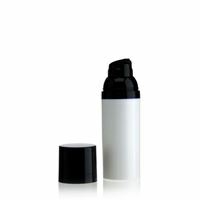 Our offer is aimed at both private, business and institutional customers. To sum it up: World-of-Bottles offers here a professional product that also can be used for hobby and household applications. 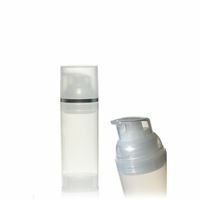 Finally yet importantly, World-of-Bottles has an attractive offer for cosmetic and pharmaceutical companies and pharmacies.